33176 PER1204.jpg 500X638\PER1204.jpg 33177 PER1204_1.jpg 500X638\PER1204_1.jpg Send A Hint! Product Description: less text Up the wine glass count with a bottle of Diemersfontein Pinotage (750ml) which comes presented in a wooden crate with sliding lid which is engraved with a unique 'Age and glasses of wine should never be counted' design. 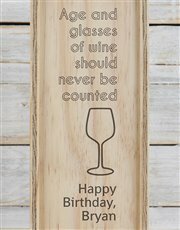 It is also personalised, making this one awesome gift! *Exact colour and consistency of the engraving will vary depending on the grain of wood. 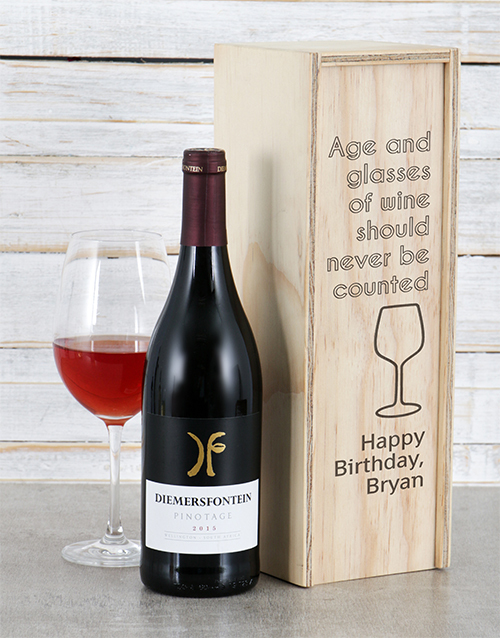 ** Wine glass not included Get this Personalised Age And Wine Crate delivered with NetFlorist.